Saint Dr. Gurmeet Ram Rahim Singh Ji Insan , generally known as “One Man Army” took Mumbai’s Entertainment industry into his hands with a bang. 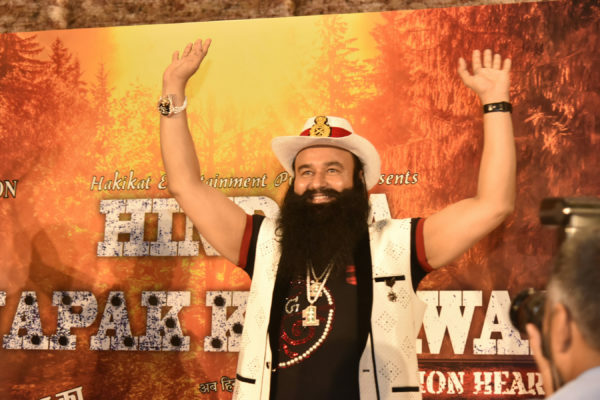 With his 4th movie, Hind Ka Napak Ko Jawab MSG Lion Heart 2 round the corner, he blasted Mumbai city with a Grand Premiere which turned out to be Largest Premiere Show in Mumbai. As the night begin with a grand entry by Saint Dr. Gurmeet Ram Rahim Singh Ji Insan with thousands of fans dancing and enjoying together. Accompanied by his Director Daughter Honeypreet Insan & Singer daughter Amarpreet Insan & Charanpreet Insan. Saint Dr. Gurmeet Ram Rahim Singh Ji Insan pulled off a white Jeans with Black Designer T-shirt & White Jacket with a matching Cowboy Hat with three daughters in Designer Gowns. The night ended with a melodious Live Performance by Saint Dr. Gurmeet Ram Rahim Singh Ji Insan himself. Present were Shekhar Suman, Ashfaq Khopekhar, Yogesh Lakhani, Ajay Kapoor among others. Saint Dr. Gurmeet Ram Rahim Singh Ji Insan also awarded Family of Uma Shankar, who was martyred in Uri Attack with a cheque of Rs 1 lac. In a statement, Shekhar said, “Its very gutsy to make a movie on such a topic, Its his patriotism which reflects from Hind Ka Napak Ko Jawab”.